Just a reminder that there are resources on this blog to help with your Controlled Assessment. First up is perfecting the introduction or ‘Setting the Scene’. This is the first impression you give to myself and the examiner about how good a geographer you are. It is important to write in a formal future tense – of what you are going to do. You are not answering the question here, you are introducing the project and what will be done. It is essential that you include links to theory in here, e.g. longshore drift, how geology can influence a coast, what geomorphology is, what geology means, what distinctive means, how waves work and the difference between destructive and constructive waves, why coastal management is used and how it can influence. You are basically saying to the examiner ‘look, I don’t know the answers yet but this is what I already think based on my knowledge of coasts already’. It is what sets you apart from non-geographers. Anyone can say ‘this is a beach, it has different types of material, it has a cliff’ – the GCSE Genius Geographer (all of you!) will say ‘I expect to see a beach that has been formed by constructive waves and longshore drift, this is when…………….’ . Don’t forget you can email me at any point, and attend workshop on Mondays for help. Year 11 – this is the booklet for your controlled assessment fieldwork to Hengistbury Head. Remember the booklet is for the fieldwork day and is to be completed in detail for you to refer back to when you complete the rest of the project. Bear in mind the overall title at all times: To what extent is geology the main influence on the distinctive coastal landforms of Hengistbury Head and Mudeford Spit? This needs to be broken down. Firstly, you need to identify what the distinctive (unique, unusual) landforms are first, e.g. the spit is distinctive compared to other areas within a 50mile radius, the headland is distinctive because of its history, the marsh is distinctive because it is a SSSI (Site of Special Scientific Interest) and has a protected species. Then consider what ALL the possible influences are on the landforms: geology, human influence (coastal management and the nature reserves), geomorphic processes (erosion, deposition, transportation). Try to weigh up and predict which factor you think will be most influential on changing the landforms. You can argue the case that geology IS the main influence, or is NOT. So long as you can PROVE IT by collecting data / evidence on the trip and in your research. Your evidence must be analysed and explored using theory (e.g. link longshore drift to the type of geology, link the creation of the salt marsh to the presence of groynes, etc.). Remember: fact, theory, evidence. Analyse, explain, suggest. Year 10 – your controlled assessment resources are on here to refer to. I’ll add more in as we get through. You can argue that geology is or is not the main influence – ‘to what extent’ means ‘how much’, so you need to evaluate the influence of geology. First you need to define ‘distinctive’. Then you need to decide what landforms are distinctive at Hengistbury Head. then you can evaluate what has had an influence on these landforms. Consider: What coastal landforms are there? Are they distinctive? How does geology have an impact? What other influences are there? What coastal processes are involved? How do they influence the landforms? What is the impact of people? Is there evidence of coastal management and how does this effect the landforms? Coastal Comparison – How distinctive is Reculver coastline? Why not make your controlled assessment stand out a little bit from the rest? Take your research a step further and consider comparing to another stretch of coastline. After all, the topic is ‘How distinctive is your coast?’ and to answer this it would make sense to compare the processes, landforms, land use and management of different coasts in order to make a decision. You know it makes sense. Below are some links for those of you who are feeling adventurous. 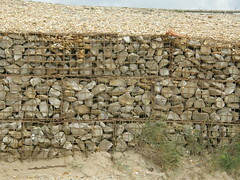 They are for a stretch of coastline at Reculver, in Kent. This area of coast is bordered by the North Sea and exposed to high rates of erosion – typically up to 2metres a year. The geology is soft, low resistant rock – particularly Sandstone & Clay – which is lying on top of Chalk. This mix is structurally weak since the less resistant rock is prone to slumping and saturation, and so slides over the more resistant chalk – like a gooey cake collapsing. The area is also a SSSI, just like Hengistbury Head. Reculver is part of a country park, just like Hengistbury. It is famous for having historic towers and has been an ancient site since Roman times – just like H.H. was also a historic fort on the headland. What you might start to be realising is that perhaps H.H. and Reculver in themselves are not naturally distinctive. Geomorphic processes might be very similar. Longshore drift and erosion occurs at both. Landforms are similar – both areas have headlands and suffer cliff clumping. Hengistbury Head does have Mudeford Spit which is different, but spits are not that unusual. So perhaps what is distinctive about these places is how humans have used and altered them? Perhaps land use is distinctive. Both areas have tourism but maybe for different reasons. Both are protected as SSSI, perhaps for different reasons. Maybe it is how people think and feel about a place that makes it distinctive? Your teacher will check your progress each lesson to ensure that you are on track and this will be recorded on the class tracker spreadsheet that you will see each lesson. Remember to get the help you need as we go along, during the ‘Setting the Scene’ phase your teacher is able to help – this is not an option once we get to High Control so seek help immediately! Below is the resource for your Data Collection lesson. Remember to keep your ‘www’ tracker and target sheet up to date and in your folder. Every 4 lessons your teacher will review your target sheet and give you feedback with a new target. 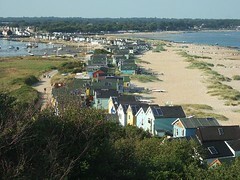 Year 10 – 2013 Controlled Assessment – How Distinctive is Hengistbury Head? This is for year 10 doing your controlled assessment Fieldwork Focus project. – this website, find links to lesson resources. Just search the tag cloud or the search button. Here are the links for all the lesson support material you have had in class. Remember, this project is worth 36 marks and you are responsible for completing all the introduction work, data presentation and preparation work by 1st June – after this you will get an exam time to turn up and do the final high control Analysis and Conclusion, job done!